The John Elliott Classics Museum’s collection of rare antiquities has been bolstered by the donation of four pots from ancient Cyprus, the oldest of which dates back about 4,000 years. They have been donated by Mrs Kit Clarke, whose daughter Sally Gregor is a current student. Mrs Clarke acquired the pots while living in Cyprus during the early 1970s. 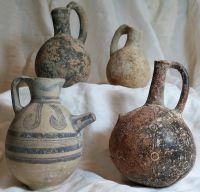 “In general they can be described as juglets, used to hold a liquid, although of what type is uncertain,” the Museum’s Neil Apted said. The youngest pot, a white painted juglet or feeder/dropper flask, dates from the Cypro-Geometric or Cypro-Archaic period, circa 800-600 BC. The multiple horizontal lines on the belly and the concentric pendant hooks on the shoulder show the influence of Mycenaean pottery decoration. The decorative detail is painted in a dark pigment on a pale slip coat. This pot is almost identical to one held by the British Museum. The oldest pot, a juglet with a spherical body and narrow neck, dates from the Early Cypriot III or Middle Cypriot period, circa 2200-1800 BC. It is covered with a thick red slip which is incised with lines and circles. The incisions would have originally been filled with a white material such as gypsum. The decoration is very close to that on a pot of different form also in the British Museum. The four pots are now on display in the Classics Museum, which is located in the Stanley Burbury building on the Sandy Bay Campus. The museum is open to the public, Monday to Thursday, 9am-Noon; 1pm-4pm.